NEET Eligibility 2019 | Age Limit, Qualification, Reservation, 15% All India Quota, Etc. Exams » NEET » NEET Eligibility 2019 | Age Limit, Qualification, Reservation, 15% All India Quota, Etc. 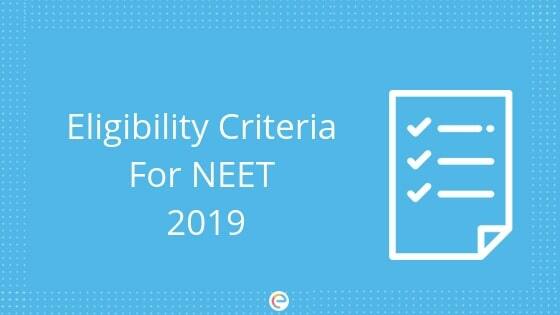 NEET Eligibility 2019: NEET eligibility criteria 2019 needs to be fulfilled by NEET 2019 candidates before they start filling the NEET application form. It is important that the students understand and satisfy all the parameters under the NEET eligibility criteria 2019. NEET is national level medical entrance exam which was previously held by the Central Board of Secondary Education (CBSE) but from 2019 onward, the National Testing Agency (NTA) will be the conducting body for NEET. NEET exam is held for students aspiring for undergraduate courses like MBBS and BDS in government and private colleges across India. NEET 2019 will be conducted as per regulations framed under the Indian Medical Council Act-1956 as amended in 2016 and the Dentists Act-1948 as amended in 2016. In this article, we will provide you with complete information regarding the NEET Eligibility 2019. Before we proceed with understanding the NEET eligibility 2019 parameters in detail, let us first have a quick overview of NEET 2019. (a) A student must have completed an age of 17 years at the time of admission under NEET eligibility or should complete the age on or before 31st December of the year of his/her admission to the 1st year MBBS/BDS Course. (b) The upper age limit for NEET is 25 years as on the date of examination under NEET eligibility with a relaxation of 5 years for candidates belonging to OBC/SC/ST category. Note: Indian Citizens/ Overseas Citizens of India intending to pursue MBBS/ BDS from a foreign Medical/ Dental Institute also need to qualify NEET (UG). (a) Indian Nationals, Non Resident Indians (NRIs), Overseas Citizen of India (OCI), Persons with Indian Origin (PIO) and Foreign Nationals are eligible for admission in Medical/Dental Colleges subject to rules and regulations framed by the respective State Governments, Institutions and the Government of India as the case may be. (b) Foreign nationals may confirm their eligibility from the concerned Medical/Dental College/State. (a) Candidate must have passed in the subjects of Physics, Chemistry, Biology/Bio-technology and English individually and must have obtained a minimum of 50% marks taken together in Physics, Chemistry and Biology/Bio-technology at the qualifying examination and must have come in the merit list of NEET (UG) – 2019 for admission to MBBS/BDS Courses. (b) In respect of the candidates belonging to Scheduled Castes, Scheduled Tribes or Other Backward Classes, the marks obtained in Physics, Chemistry and Biology/Bio-technology taken together in qualifying examination shall be 40% marks instead of 50% marks for Unreserved Candidates and 40% for SC/ST/OBC candidates. (c) In respect of PwD candidates, the minimum marks in qualifying examination in Physics, Chemistry and Biology (or Botany & Zoology)/Bio-technology taken together in qualifying examination shall be 45% instead of 50% for Unreserved category candidates. (d) Students educated abroad seeking admission into medical colleges in India must have passed in the subjects of Physics, Chemistry, Biology/Bio-technology and English up to the 12th standard level with 50% marks and their equivalency determined by Association of Indian Universities (AIU) as per regulations of the Medical Council of India and the concerned University. How To Choose Your NEET Eligibility Qualification Code? There are 7 qualification codes in total as per the NEET Eligibility Criteria 2019. If a candidate does not fall within the qualifications prescribed as per code number 01-07, he/she should furnish complete details to determine NEET eligibility. A student is, therefore, required to choose any 1 of them. The following are the qualification codes. CODE 01 A candidate who is appearing in the qualifying examination, i.e., 12th Standard in 2019 whose result is awaited, may apply and take up the said test but he/she shall not be eligible for admission to the MBBS or BDS, if he/she does not pass the qualifying examination with the required pass percentage of marks at the time of first round of counselling. CODE 02 The Higher/Senior Secondary Examination or the Indian School Certificate Examination which is equivalent to 10+2 Higher/Senior Secondary Examination after a period of 12 years study, the last two years of such study comprising of Physics, Chemistry, Biology/Bio-technology (which shall include practical tests in these subjects) and Mathematics or any other elective subject with English at a level not less than the core course for English as prescribed by the National Council of Educational Research and Training after introduction of the 10+2+3 educational structure as recommended by the National Committee on Education. CODE 03 The Intermediate/Pre-degree Examination in Science of an Indian University/Board or other recognised examining body with Physics, Chemistry, Biology /Bio-technology (which shall include practical test in these subjects) and also English as a compulsory subject. CODE 04 The Pre-professional/Pre-medical Examination with Physics, Chemistry, Biology/Bio-technology & English after passing either the Higher Secondary Examination or the Pre-University or an equivalent examination. The Pre-professional/Pre-medical examination shall include practical test in these subjects and also English as a compulsory subject. CODE 05 The first year of the three years degree course of a recognised University with Physics, Chemistry and Biology/Bio-technology including practical tests in these subjects provided the examination is a University Examination and candidate has passed the earlier qualifying examination with Physics, Chemistry, Biology/Biotechnology with English at a level not less than a core course. CODE 06 B.Sc. Examination of an Indian University provided that he/she has passed the B.Sc. Examination with not less than two of the subjects Physics, Chemistry, Biology (Botany, Zoology)/Bio-technology and further that he/ she has passed the earlier qualifying examination with Physics, Chemistry, Biology and English. CODE 07 Any other examination which in scope and standard (Last 02 years of 10+2 Study comprising of Physics, Chemistry and Biology/Bio-technology; Which shall include practical test in these subjects) is found to be equivalent to the Intermediate Science Examination of an Indian University/Board, taking Physics, Chemistry and Biology/Bio-technology including practical tests in each of these subjects and English. (c) 27% seats in Central Educational Institutions are reserved for OBC candidates only as per Central Educational Institutions (Reservation in 15 Admissions) Act, 2006. Reservation would be applicable to the castes mentioned in the Central list of OBC. Thus, the candidates falling in this list may mention OBC in the Category Column in application form. Candidates from creamy layer and those who do not come under Central List of OBC are advised to mention their category as Unreserved (UR). NOTE: Please check the official NEET Eligibility 2019 PDF attached below for details. With few months left for NEET 2019, candidates must revise the NEET syllabus thoroughly and solve as many NEET practice questions as possible. They should also take NEET mock tests and work on their areas of improvement. Embibe provides all the necessary resources for NEET preparation. Its premium product RANKUP also provides personalized guidance that guarantees score improvement. We hope this detailed article on NEET eligibility helps you. If you have any query pertaining to NEET eligibility, feel free to post your comments below and we will get back to you. Want to take free tests for NEET? Hey Kartic, as far as I know, you can appear for NEET. But you have to secure 50 percent in aggregate in Physics, Chemistry, and Biology. in the board exams. I am doing 12 from CBSE patrachar. May I eligible for NEET 2019? I have completed 12th in 3yrs. Not gap, Bt Fail last year nd Pass this year. Am I eligible for NEET…? Hi, you will have to wait for the official notification to be released to get the correct information. Is it possible to write the NEET exams if i have completed all the subjects mentioned on both IGCSE and AS Level exams? Whether i can apply for Neet exam if iam completed 12th(with phys,bio,chemi&english) in 2012 and i have completed B.Engineering.If i can apply, What is the codefor applying? I don’t think so. Because they have not mentioned any code for BE Candidates. However, Its better if you clarified your doubt from official authorities. NEET is mandatory for both of the courses. i passd in physics with gress marks (4) and my pcb aggregate is 56% in board . Am i eligible for neet 2019 exam ? yes if you fulfill the eligibility criteria you can attempt NEET exam.